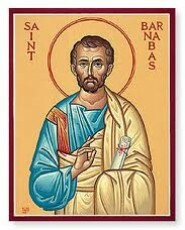 St. Barnabas was born Joseph, and was an early Christian. Although not one of the original Twelve Apostles, Barnabas was referred to as an apostle by the early Christian Church (Acts 14:14.) There is also a Church tradition, which says that Barnabas was “First of the seventy disciples of our Lord”. Having been ordained along with the apostle Paul for their first missionary journey by the church in Antioch, both Barnabas and Paul enjoyed the title and dignity of Apostles from that time forward. This took place around 45AD. Barnabas and Paul’s missionary journey was confined to Cyprus and Asia Minor. It is well documented in the New Testament book of Acts. On Barnabas’ second missionary journey, he returned to Cyprus, his native island. The apostles Barnabas and Paul on their first missionary journey had founded the Church of Cyprus. Barnabas suffered death in his native town of Salamis on Cyprus. He was one of the earliest Christian disciples in Jerusalem. According to Acts 4:36 Barnabas was a Cypriot Jew, and was named an Apostle in Acts 14:14. He and Paul the Apostle undertook missionary journeys together and defended Gentile converts. They traveled together converting people, and participated in the Council of Jerusalem in the year 50, an early Church Council. Barnabas and Paul successfully evangelized among the “God Fearing” Gentiles who attended synagogues in various Hellenized cities of Anatolia. Barnabas’ story appears in the Acts of the Apostles, and Paul mentions him in some of his Epistles. Christian traditions hold that Barnabas was martyred at Salamis, Cyprus in 61 AD. Barnabas is usually identified as the cousin of Mark the Evangelist on the basis of Colossians 4. The name Barnabas means “Son of consolation” or “Son of Encouragement”. A similar link between “prophecy” and “encouragement” is found in Paul’s letter to the Corinthians (1 Corinthians 14:3). He appears mainly in Acts, a Christian history of the early Christian Church, and also in several of Paul’s Epistles. St. Barnabas was born Joseph, and was an early Christian. Although not one of the original Twelve Apostles, Barnabas was referred to as an apostle by the early Christian Church (Acts 14:14.) There is also a Church tradition, which says that Barnabas was “First of the seventy disciples of our Lord”. Having been ordained along with the apostle Paul for their first missionary journey by the church in Antioch, both Barnabas and Paul enjoyed the title and dignity of Apostles from that time forward. This took place around 45AD. Barnabas and Paul’s missionary journey was confined to Cyprus and Asia Minor. It is well documented in the New Testament book of Acts. On Barnabas’ second missionary journey, he returned to Cyprus, his native island. The apostles Barnabas and Paul on their first missionary journey had founded the Church of Cyprus. Barnabas suffered death in his native town of Salamis on Cyprus and was buried secretively by his nephew John Mark. It is believed he was martyred in 61 AD.